The design style that you choose for your cabinetry sets the overall tone for your space. Haynes Cabinet Design offers a wide range of design styles to fit the exact look that you envision. Learn more about the various styles below or check out our Gallery page to see more examples of our work. Traditional doesn’t necessarily mean old world or country, but is a timeless style that’s warm and inviting. It’s charming and perhaps elicits fond memories of hours spent together with friends and family enjoying great meals. It’s a comfortable sophistication that provides a retreat from the stress of daily life. It’s common for traditional style kitchens to use soft, creams and whites. It’s also easy to create a very unique look as traditional kitchens naturally allow for an eclectic blend of textures, colors and styles. Filled with symmetry and balance, contemporary kitchens provide a retreat-like feeling that feels clean and warm, yet is fashion-forward and exciting at the same time. Contemporary kitchens are sophisticated, not stark. The style is clean, simple and uncluttered. The contemporary style often borrows elements from the modernist design movement, but doesn’t sacrifice function for form. The core idea throughout is clean and simple..
Furniture style cabinets take cues in their lines and decorative elements from high-end furniture design. Cupboards that resemble an armoire, an island that could feel at home in the den, or custom architectural elements – these are characteristics that define this style. Furniture style cabinets can be designed to fit a certain theme or can be assembled in a way that gives the feel that each piece was acquired individually over a period of time. Furniture style cabinetry gives a sophisticated feel that is warm and welcoming at the same time. Early American style cabinets feature simple, straight lines with minimal ornamentation. Any ornamentation that is in the design is often limited to simple posts and turnings. The look is warm and comfortable. It’s clean and modern, yet it looks like it’s been there for years. Some element of color is often incorporated into the design. Muted blues, reds and greens are very popular for the Early American style; however, we can always finish your cabinets to fit any design plan. Ornate kitchen cabinets make a strong, bold statement. Architectural elements are often included, giving the cabinetry a sense of weight and elegance. It’s common for this style to include detailed posts, intricate turnings and high-end molding. This is a sophisticated style for a sophisticated taste. Ornate kitchen cabinets are often stained with a deep, rich color to show off the beauty of the hardwood or they may be finished in a cream color with a tobacco wash or other technique to highlight the intricacy of the design. 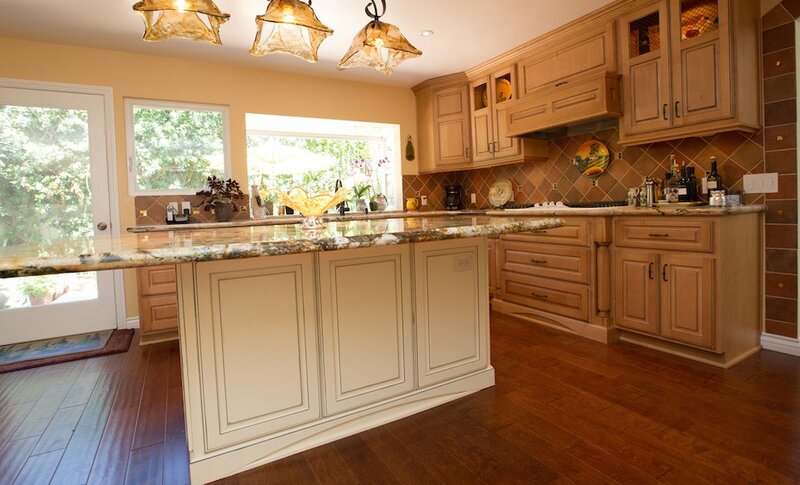 Shaker style cabinets are a distinct design that is very popular today. They are classic and simple and lend themselves well to a traditional or contemporary style. Flourishes and ornamentation is minimal in favor of functional aesthetic. It’s common for Shaker style cabinets to have a simple door with a recessed center panel. Finishes are traditionally kept simple to highlight the clean lines and high-quality craftsmanship that this style of cabinet is known for. Shaker style cabinets are beautiful and timeless.